The Pontiac Firebird Trans Am is the car of choice for the 1996 True Value Hardware Stores International Race of Champions. Twelve of the world's best drivers will debut the Firebirds when the IROC Series takes the green flag at Daytona in February. Mike Laughlin, one of the country's premier race car builders, designed and built the IROC Firebird Trans Am's 600-pound tubular steel frame. Bodywork was moulded by Diversified Glass Products Inc. of Marlette, Michigan, while the assembly took place at the 20,000-square-foot IROC shop in Tinton Falls, New Jersey. IROC's Firebird engine is a modified version of the 350-cubic-inch, 5.7-liter V8 powerplant found in the production Trans Am. The IROC engine generates nearly 500 hp at 6900 rpm. It also has a unique, crisscrossed exhaust system developed by "Dr. Gas," which is similar to the system used by some NASCAR teams (like the #4). 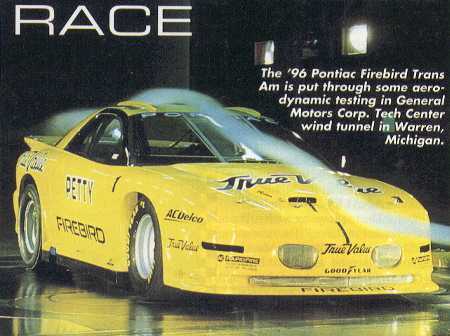 The system balances out exhaust backpressure and flow to help push the IROC Firebirds to speeds approaching 190 mph at Daytona.